Our vision is to engage all your senses so to let you experience the unexpected and utterly beautiful. It all began when Alexander wrote a letter to Eva. A letter that spurred the collaboration between the two sparking the birth of the ideas of what you see today. At its origin, it was an orchestra that portrayed each of the objects, but as it journeys on these delicate instruments transcend to depict the true nature of the instrument and its sounds. This transforms the lightheartedness of a guitar into a sunrise, and the deep tones of the bassist into a dark misty forest. The drummer brings his percussion to life through art, every instrument and every action bringing life to the otherwise inanimate instruments. Before drifting away to the sound of the sound of the Violinist, who with the help of water drops enhances the experience, you must meet the singer who with her words starts this whole journey. The lady singer consists of one glass body inside another. The inner object is shaped like a whirl, where the words are trying to reach out, from and around, the object. A glass bubble embraces the whole. The black handtufted rug on the floor has a three dimensional pattern, also in the shape of a whirl, that enhances the light effect by creating a shadow pattern with it´s three dimensional shape. The first sketches presented the globe on its journey prior to explosion. 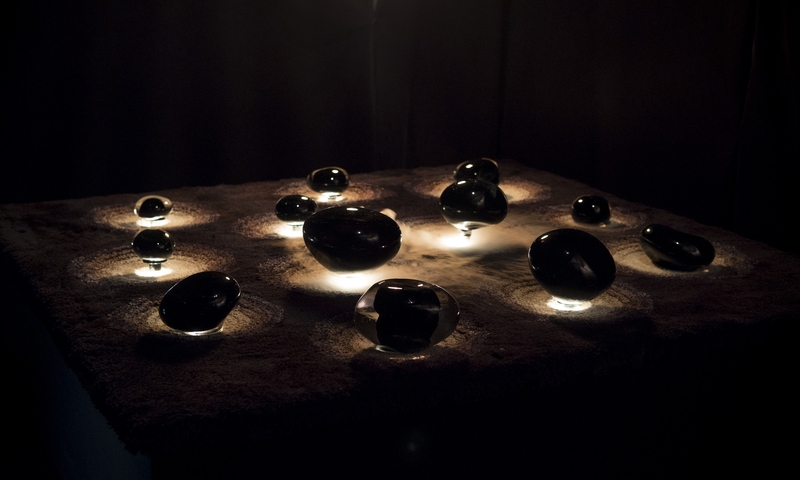 The installation evolved throughout the project into a bubbling volcanic creation, where ten stones of glass slowly move up and down in conjunction with the music. When the stone rises upwards, the light comes out and brightens the area surrounding it. The stones are resting on a handtufted rug with craters surrounding each individual stone. A drop of water in a sparkling summer lake sets the shape of this installation. The sound of leaves flickering in the wind and the sun reflecting in the deep blue water. 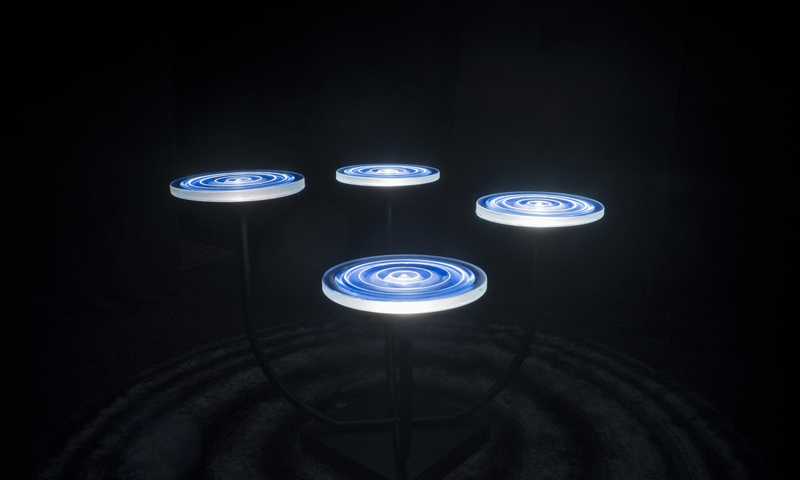 Four dark blue glass plates float in the air in a wave pattern, similar to the one moving after the landing impact of a falling water drop. The light inside the plate moves in the same direction as the waves. On the floor accompanied by a handtufted dark blue rug with a similar three dimensional wave pattern, shading itself brighter when reaching the wave peak. 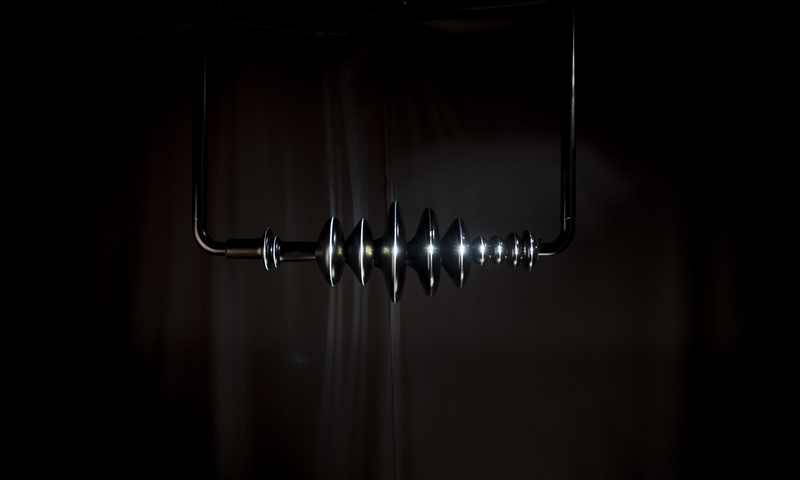 The Sunrise originates from the profile of the sound wave in the music piece that Eva created for this installation. 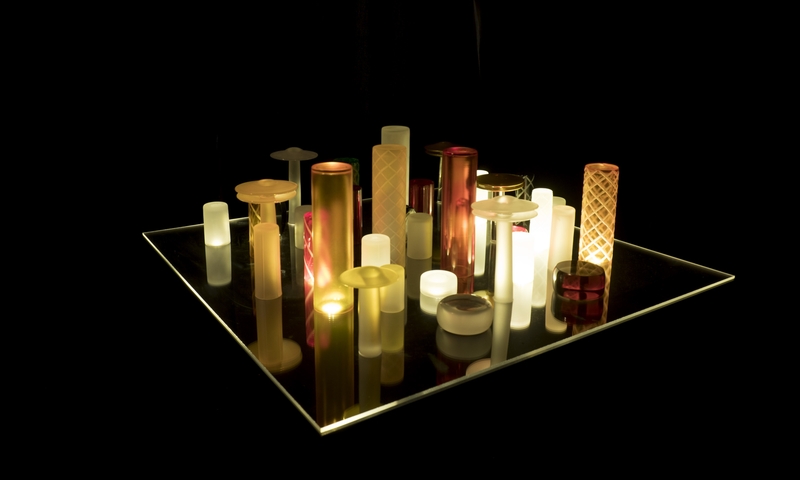 The glass object is a reversal of the sound wave, where light flows out from the peaks of the wave. On the floor there is a handtufted rug that illustrates a sunrise in a dewy forest clearing from the shadow created by the shape of the sound waves. The drum kit is an interpretation of each individul drum, dulcimers and bass drums, creating a little town of unique shapes, colours and patterns. 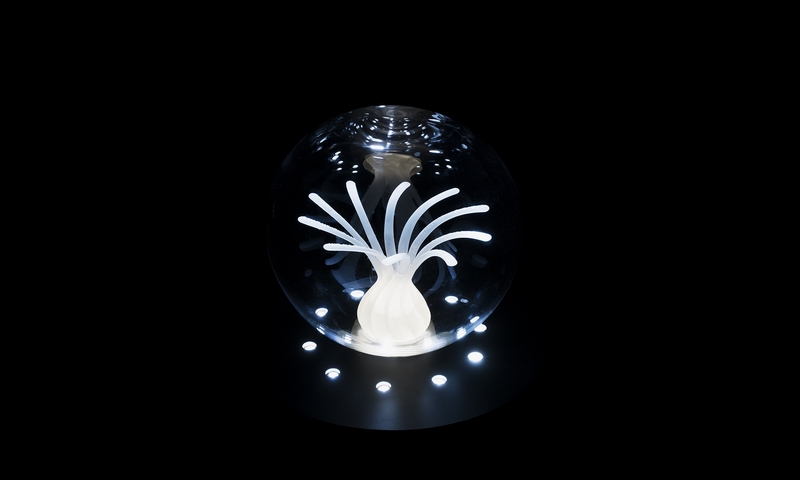 Light had a determining role in the installation from the very beginning, as a source of creating vision and the impression of life extracting itself through the different objects in time with the music. The colour scale is warm and continues down along the floor where the rug slowly fades out disappearing into nothingness.